A plain wedding ring isn't the most elaborate option, but there are many ways to personalize this classic design so it will always be a treasured symbol of your relationship. Plain rings are ideal for those who don't like gemstones, want to save money on a ring or need functional ring; using a wide band gives you plenty of room to engrave or customize if you choose. WeddingBands has a ten-millimeter wide ring that comes in 14K or 18K white or yellow gold and has a polished finish. The surface of the ring is perfectly flat and the ring weighs approximately 8.9 grams. It's listed as one of the company's most popular plain designs. It retails for between $400 $700 depending on type of gold selected and ships for free. .
ApplesofGold.com carries a 14K rose gold band that is eight millimeters in width. It has a high polish and is made of solid gold. While the outside of the ring is slightly domed, the interior has a comfort fit with smooth edges for the best fit. It ships for free in just two to three days. 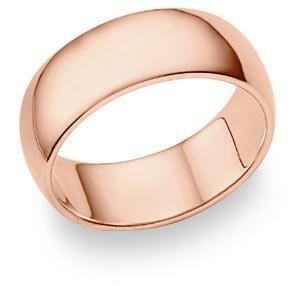 A customer who purchased a ring in rose gold was impressed with the quality of the ring and the company's customer service. The ring retails for $725. Wedding Rings By Oromi carries a 10-millimeter flat, high polished ring that has a comfort fit interior, so while the exterior is flat, the interior is slightly curved for maximum comfort. It's available in 14K or 18K white, yellow or rose gold, and is made of solid, extruded gold. The ring retails for between $700 and $1,100 depending upon the type and weight of gold selected. GoldenMine has an eight-millimeter traditional style yellow gold plain ring that is available in 10K, 14K or 18K with a high polish finish. The traditional style gives the ring a slightly curved exterior, rather than a flat finish. You also have the option of having free engraving on the ring. The ring comes with a lifetime guarantee and retails for between $400 and $960 depending on the weight of the gold selected. A plain gold ring does not have a lot of embellishments, carvings, or other accents, but there are still ways to personalize the ring. The easiest is through the type of gold used, but couples can also choose from several design options for plain rings that add distinction to the style without sacrificing the simplicity. 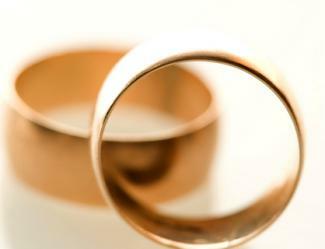 The type of gold a couple chooses will affect the appearance and durability of the rings. The karat value of gold is a measure of its purity, with one carat being equal to 1/24 of the ring's total composition. Most wedding rings are 10, 14 or 18 karat gold to combine both the beauty of the gold with a more practical and durable alloy. The more pure the ring is, the softer and less durable the metal will be, which is a vital consideration for rings that are meant to be worn continuously. Higher karat values also have a richer yellow color, but yellow gold is not the only option for a plain gold wedding ring. White gold is also popular, and over time white gold rings will develop a vintage patina that lends them character and distinction. Rose gold is a less common option with its pinkish blush, but can be a lovely choice. Width: Wedding rings that are 2-4 millimeters wide are the most common, but rings considered to have wide bands generally range from eight to 12 millimeters. Shape: Plain bands can be rounded or flat. Rounded rings are more popular for women's designs while flat rings are found more frequently for men's wedding rings. Texture: A very subtle texture can be added to a plain gold ring without making it more elaborate than necessary. 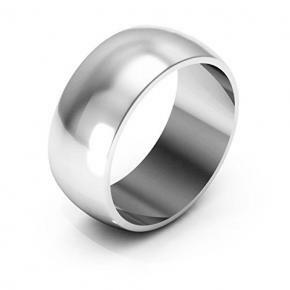 The ring could be brushed, giving it a subtle matte finish, or polished to a high gloss finish. Hammering is another way to add gentle texture to a plain ring. A plain wide gold wedding ring is an excellent choice for a simple but beautiful band. With subtle ways to personalize the ring, even a simple style can reflect your personality as easily as it reflects the love in your marriage.